Here and Now print by The Wheatfield on etsy. Wireless remote for my camera. Bamboo Doily Clock from uncommon on etsy. Domino: The Book of Decorating. What is on your wish list this year? Any completely fantastic etsy shops I should be sure to browse as I choose gifts for friends, family and coworkers? Do share! 1. A pair of either knee high boots, cute wedges or a flats. And of course, a lot more. :P I love giving AND getting presents. ♥ But as long as I'm with my wife and kitty and everyone's healthy and happy, I'm happy! 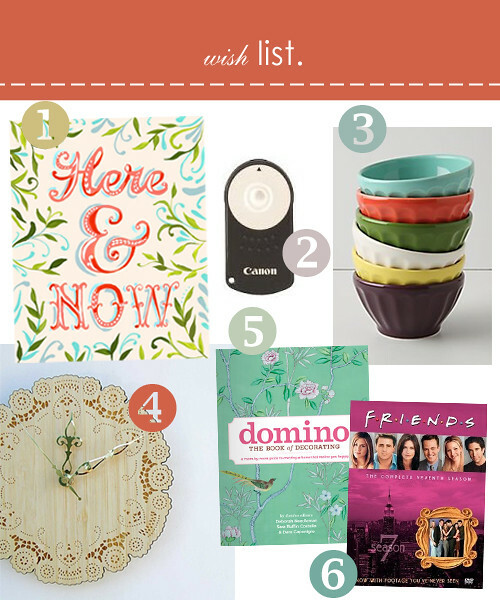 Those latte bowls have been on my must-have list forever! Sigh. I love them so. I found that Domino book in Urban Outfitters London for about $20 cheaper than it would've been to buy in Australia. It's amazing. Keep it on your list no matter what! I'm working Christmas Day and Christmas Eve... for the third year in a row. I just can't find the Christmas Spirit yet. Excellent list! I want a camera remote too! Love that print, the clock, and I bet that book is excellent! Everything on your list is great, really. Great list. Im thinking of making my wish list too. aw, i have those anthro bowls and somehow they make a bowl of oatmeal a joyous experience. :) such a wonderful list. yay christmas! Those are latte bowls?! I've been using them to put salsa and sour cream in on taco nights...womp wommmmmp. PS: Your wishlist is adorbs. Jimaie got me a few of those bowls as a bridal shower gift, I looove them. They are so colorful! Love those latte bowls. I have a set of 4 from Target and they are so useful! Great for taco night. The Domino book is a great, fun read. I miss that mag! On my wish list is The Pioneer Woman Cooks. My husband has asked me where to buy such a book....I think I may have a little problem! hhahaha, I use my latte bowls for the same thing that Amy does, taco fixings just look so darn cute in them!! I am greedy and my wishlist is far too long to post without embarrassment, true story. Those bowls aren't too unreasonably expensive, either! Which is surprising, for Anthro. Random note- Season 7 of Friends is the only one I don't have. And those latte bowls are amazing. Just stumbled across your blog and have fallen in love with it. seriously. I love how your voice shines through when you write and you have a very real blog. My wish list includes time [because I never have enough], some organizational abilities, shoes, and something yummy I can eat. Hope you are having a lovely weekend! XO. i really want those bowls but i'm pretty sure matt would kill me if i got any more bowls, we have bowl overload in our apartment, haha. You just have to get some of those latte bowls, they are AMAZING!! I have them in the kelly green and the seafoam colors. I also have the mini latte bowls from Anthropologie too. They are perfect for portion controlled snacks, fruit, or to use as pinch bowls. I really hope santa brings you some! Here are some things on my wishlist. 6. Bathina "Take a picture..it lasts longer"
my list is rather short this year...it includes: the GorillaPod - so awesome! friends? <3 <3 <3 still watch re-runs every chance i get.